Many of my readers are probably already aware that I, along with another Cherokee Nation citizen, Cheryl Brown, have filed a complaint with the Cherokee Nation Attorney General's office concerning a breach of confidential information and violation of the federal Privacy Act protecting that information. While Chief Baker's supporters are trying to spin the complaint into a political issue, it isn't. This complaint is about protecting the privacy of ALL Cherokee citizens. If an unauthorized release of information happens to one of us, it could happen to ANY of us. No matter where you fall in the political spectrum during this election cycle, I think we would all agree that our people are justified in expecting that our right to privacy is protected. Ms. Brown and I have a history of speaking out when we see wrong doing. 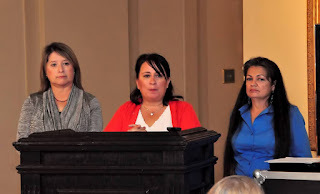 Cheryl Brown, left; me, in the center; speaking at the Oklahoma City press conference about Chief Baker's participation in the Inhofe pigeon shoot. The complaint we filed is not about a candidate for council, but instead about a person in a position of trust violating that trust. Currently, this complaint only focuses on the contractor who is in question of violating the trust of the Cherokee people. Should this complaint, which has five strong pieces of documentation supporting it, be swept under the rug, it will then not only reflect on the current chief, Chief Baker, who gave this person access to confidential records by giving him a job, but it will also be a reflection on our Cherokee Nation Attorney General, bringing into question whether Cherokee citizens are able to get justice through that office. Note - This is a suspected violation of the federal privacy act, therefore anyone can report it. 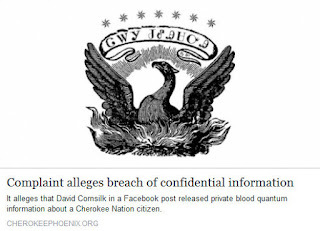 Because this is a suspected violation of the privacy act, the agency involved, the Cherokee Nation Registration Department and/or Cherokee Nation, must follow certain procedures in reporting the suspected violation. This is a shameful breach of ethics. Is it okay because you disagree with the person? By what standards is exposing private information correct?